Keep nails in top condition and help repair damage with NailExtend. This cuticle treatment helps cracked, splitting, weak and dry nails become healthier and stronger. Keep nails in top condition and help repair damage with NailExtend. 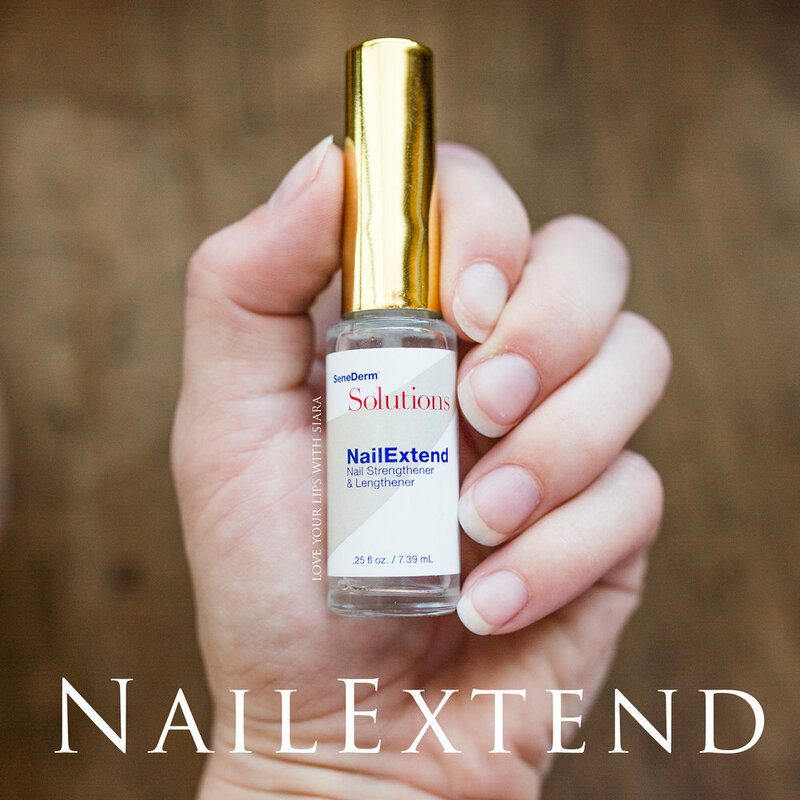 NailExtend, a nail strengthener and lengthener, was developed to treat a variety of conditions, including weak, brittle, sensitive, or peeling nails and even those damaged from acrylics and silk or gel wraps. Its unique delivery system utilizes protective ingredients, including SenePlex Complex®, vitamins, growth enhancing peptides and powerful moisturizers, to strengthen, lengthen and protect nails. SeneDerm® Solutions NailExtend is formulated to help repair existing nail damage including cracking and splitting. With daily use, future damage can be prevented as new nails grow back stronger, and results can begin to be visible after just a few weeks of use. NailExtend can be used as a daily cuticle treatment on polished nails or natural nails. For best results, apply NailExtend to cuticles twice daily or until desired results are achieved. After results are achieved, apply NailExtend to cuticles 3-4 times weekly to maintain healthy nails. Glycerin- nail hardener; helps strengthen the nail. Increases the water content and acts as a moisturizer. Myristoyl Pentapeptide-17- peptide that stimulates keratin production and nail growth. Sodium Hyaluronate- a ubiquitous carbohydrate polymer that is part of the extracellular matrix. Glucosamine HCl- enhances the body’s ability to manufacture collagen. Algae Extract- hydrates, protects skin from the sun, and softens the skin. It is essential in the penetration of the top layer of the stratum corneum and enhances the skin’s ability to repair itself. Aloe Barbadensis Leaf Juice- (Aloe Vera): most known for moisturizing, soothing, and healing. Studies indicate that Aloe Vera gel has the ability to enhance and accelerate cellular growth. Panthenol (pro Vitamin B5)- moisturizes and helps maintain flexibility of nail bed. Yeast Extract- a dietary source of folic acid (a member of the Vitamin B Complex) aids in formation of new healthy tissues and promotes new cell formation. Lactic Acid- biodegradable and low toxicity; used as a pH balancer and is a commonly used alpha hydroxyl acid used in many cosmetic formulations. Beta Glucan- stimulates fibroblast growth and collagen synthesis. Hydroxyethyl Cellulose- modified cellulose (chief constituent of fiber plants) used as a binder, emulsion stabilizer and thickener. Synthetic Urea- a compound topical antiseptic, buffering agent, humectant, and skin conditioner. The nail unit as a whole is composed of three main parts: the nail plate, nail bed and nail matrix, as seen right. The nail plate is a hard keratin structure that protects the end of the finger. The condition and appearance of the nail plate is well recognized as being an indicator of the overall health. Nail cells are produced in the matrix (or nail root) and “nourished” from the underlying nail bed until the nail plate leaves the end of the finger. This “free” nail plate is the most challenged and exposed part of the nail unit and is often in the greatest need of cosmetic attention as it is prone to breakage and splitting. The nail plate itself is comprised of flattened corneocyte cells and has three distinct layers. The dorsal (uppermost) layer is 2-3 cell layers thick and contains the oldest, most damaged cells. The intermediate layer makes up about 3/4 of the nail material, and the ventral (lower) region is 1-2 cells thick and contains the youngest, softest cells. The keratin nail plate is highly cross linked, containing approximately 10.5% cystine. This sulphur containing amino acid is responsible for holding the nail protein structure together and giving it the structural robustness it needs to perform its functions. This protein structure is porous and highly water absorbent – increasing water content results in increased flexibility. The nail plate also contains about 1% lipid, which is thought to reside between the corneocyte cells. When this is depleted, for example by solvents in nail polish removers, nail brittleness often results. The nail structure can be affected by exposure to hydration/ dehydration, solvents and detergents. It has been reported that repeated hydration/dehydration causes a condition known as onychoschizia, or lamellar dystrophy. This causes the nails to become dry, brittle and weak and to separate at the free edge. This condition has been largely attributed to decreased nail plate moisturization, possibly arising from a change in the protein structure and its ability to bind water and/or decreased water retention in the areas between the corneocytes where the lipids reside. It has been suggested that good condition (absence of lamellar dystrophy) can be achieved by hydration followed by the application of a topical agent which prevents water loss. NailExtend ingredients, when combined together, make dramatic improvements in the structure of the nail. It increases strength of the nail, and increases moisture binding properties which keep nails flexible. Add those ingredients to a peptide solution that stimulates Keratin production, and you have a fantastic nail strengthener and grower.